With the Farmers' Market Season hitting stride, we are seeing a lot of fabulous produce and fruit coming to the stands. I opened my refrigerator to grab my lunch this morning, and I looked like the inside of the old fruit trucks that used to traverse the streets of my old South Philly roots - it was chockablock full of good, fresh-picked and local food. I even have stuff from my boss' garden and mother-in-law's garden. Local to NJ, Amber, PA and Bethlehem, PA. When I have this much stuff, it makes me want to a) eat healthier and lighter; b)preserve; and c) make salsa! There is a foodswap coming up this weekend in Hammonton, NJ, organized by my friends at The South Jersey Swappers, I wanted to create peach-themed foods for our Peach Festival in Hammonton. Last week I put up Peach and Tomato Chutney. This week I've created a sweet, tart and kicky peach salsa, sure to liven up meals and snacks. 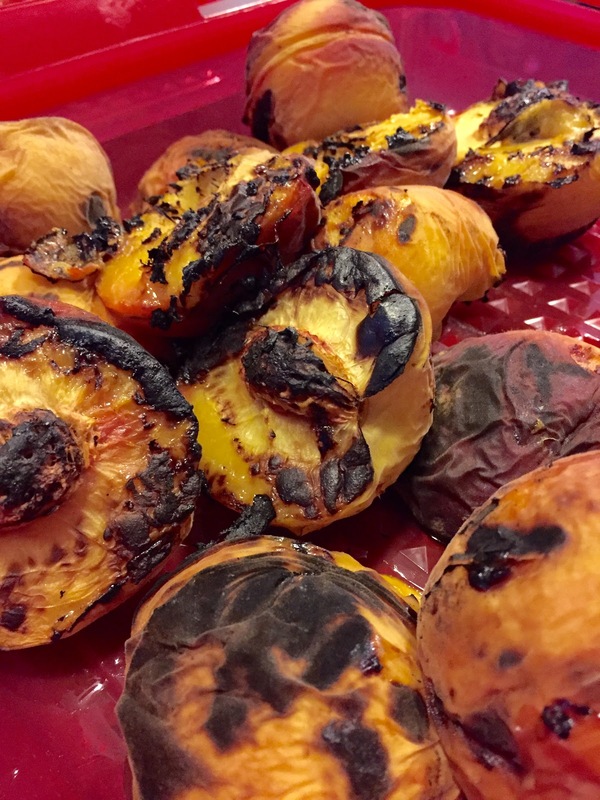 I fire roasted all of the vegetables and the peaches. The only thing that didn't hit my grill were the cilantro and limes- heck I could have done the limes too come to think of it. You can can, freeze, or just refrigerate this salsa. It's twice cooked, so it will hold for a week. Frozen, this will hold for months. Canned, it holds for a year, in a cool dark place. Once a can is opened, refrigerate and use within a week or two. I can in smaller jars, so the salsa never lasts long. This batch has a real fiery kick because I upped the amount of jalapenos to the mixture. In years past, I've lamented that I haven't had enough spicy/hot peppers and never enough cilantro. This time, to yield 4 pint jars, 8 1/2 pint jars and 2 small sample, 4-ounce jars, I used three very large-ish jalapenos, 6 limes and three bunches of cilantro; one was a large bundle and then I added in two smaller bunches. My wish came true. This salsa batch has the sweet and the heat I was looking for. The recipe is a variation of others I've posted, like my grilled mango salsa, or my fresh peach salsa cruda, or the standard, garden salsa. One could say, I really love salsa. This recipe will yield about 3-4 pints total. I essentially tripled the amounts for my canning. I like to cook by the seat of my pants. You can chop everything by hand but this takes a while. I prefer to use a food processor and pulse my ingredients, CAREFULLY! 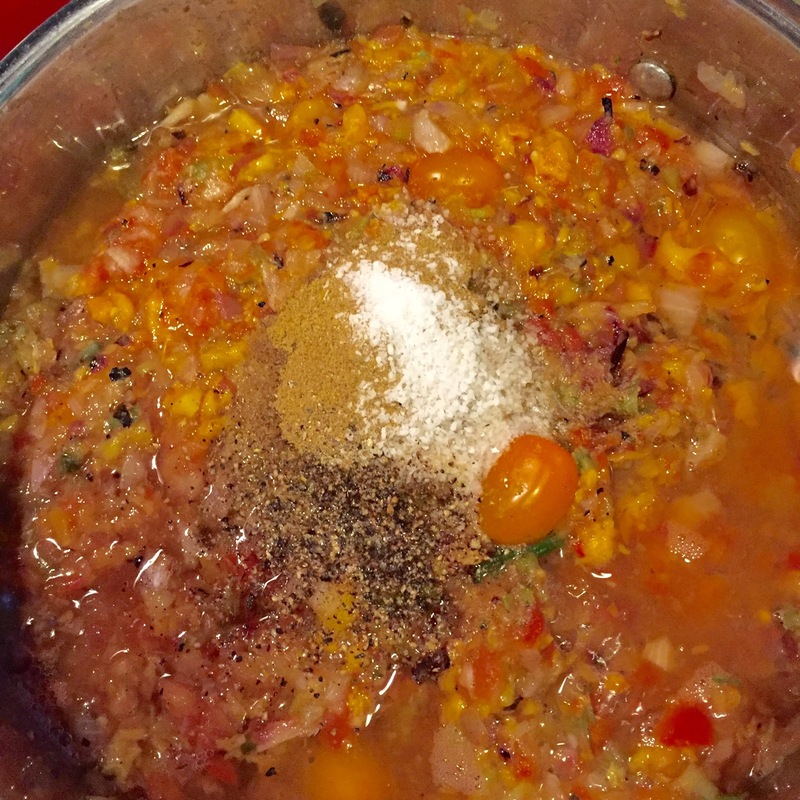 Leave some chunks; you don't want a puree of everything, otherwise you are making gazpacho! Preheat a grill or a grill pan to high heat. Clean all your vegetables and fruit but keep everything whole, except the peaches. Cut the peaches in half and remove the pits. 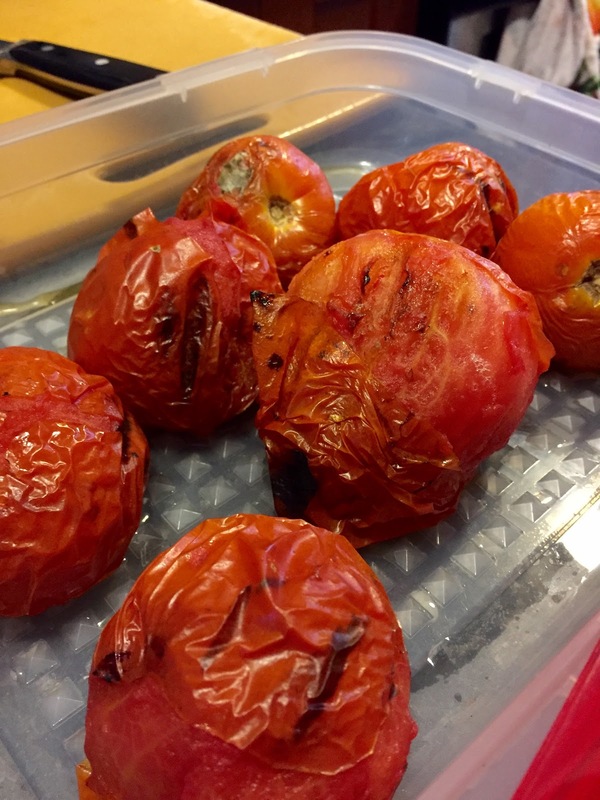 Place the vegetables and peaches on the grill, EXCEPT THE CHERRY TOMATOES (if you are using them); char everything until you achieve blistered peppers, charred, but not burnt, onions, scallions, jalapenos, tomatoes, peaches, and if you can, grill the garlic cloves. A grill wok or grilling basket is helpful, if you have it. Set everything aside onto sheet trays and cool all the vegetables until they are cool enough to handle. 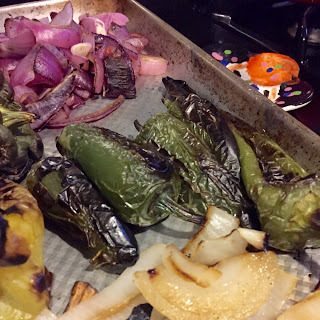 Peel the charred skin off the peppers, being careful when you peel the jalapenos. Do those last, because the seeds and membranes will burn your hands! 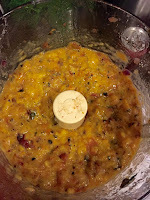 If using a food processor, add in the vegetables, one kind at a time and pulse, keeping most of the ingredients chunky. Add all the chopped or pureed/chunked ingredients into a a large mixing bowl. Rough chop the cherry tomatoes. If chopping by hand, dice all the vegetables as indicated adding each diced vegetable and fruit to the mixing bowl as you cut them - the tomatoes through the cilantro. Add everything to a large stockpot and cook, bringing the mixture to a boil, then reduce the heat and bring to a constant simmer. Add in finely grated lime zest and juice, vinegar, cumin, and cilantro, stir to combine. Stir occasional to keep the mixture from scorching. Season to taste with a pinch of salt and a few grinds of black pepper and the hot sauce. Cook for at least 1/2 hour, or longer if you are canning the mixture. When canning, I let the salsa cook while I prepare my jars, so the salsa cooks for an hour and a half, at a low simmer. The longer the salsa cooks, it reduces the water content, concentrating the flavors. Cook for no longer than two hours. CANNING STEPS: Purchase pint or half-pint jars with bands and lids. Wash canning jars, lids and bands in hot soapy water. Dry bands and set aside. Place cleaned jars and lids (but not the screw bands) into a large stockpot of water. Bring to a simmer – 180º and maintain at 180º. Carefully remove 1 jar at a time and ladle hot salsa in to hot jars, leaving ¼-inch head-space. Keep the food contents below the rim of the jar, using the top portion of the jar as your guide. Wipe jar rim clean with a clean cloth or paper towel. Place lid on jar with sealing compound next to glass. Screw band down evenly and firmly until a point of resistance is met – fingertip tight. Continue filling jars until all the salsa is used. Process the filled jars for 15 minutes back in the water-bath stock pot, then let the jars sit for 5 minutes, off the heat, in the water-bath. To double or increase the recipe, make sure you adequately increase the vinegar ratio. The acid is needed to act as a preservative. If you are using larger jars, such as quart jars, increase the time by 5-8 minutes for the water bath portion of the canning process. Remove jars from the water-bath and set them on a heat-proof table, undisturbed. Jars should seal and you will hear a popping sound within a few minutes of being removed from the water-bath. If a jar doesn't seal, meaning if you press down on the top of the jar and it springs back up, then that jar isn't sealed properly. Refrigerate any unsealed jars and use the contents within one week. Let the jars sit for up to 12 hours to cool down. Once the jars are cool, label, date and store in a cool, dark place. Use within one year. Once opened, refrigerate and use within 1-2 weeks. This recipe is so easy, fresh and fast and can be made as hot or mild as you like. 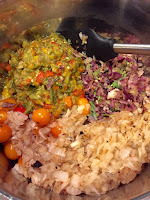 For more canning tips, see my salsa canning entry from several summers ago here. If you make a large batch of the salsa and you don't want to can it, it can be made as a cruda or a raw/fresh salsa. Just grill and chop the ingredients, put everything into a bowl and let sit for 20 minutes or longer for the flavors to develop. Quick cook the salsa according to the directions and then add the finished product to a 3 or 4 quart sauce pot. Bring the mixture to a boil, reduce heat and cook for 15 to 20 minutes, keeping the salsa at a low simmer. Cool the salsa and taste and adjust the seasonings - vinegar, lime juice and salt and pepper as needed. The cooked salsa will hold for up to 1 week. The salsa can also be turned into a gazpacho. 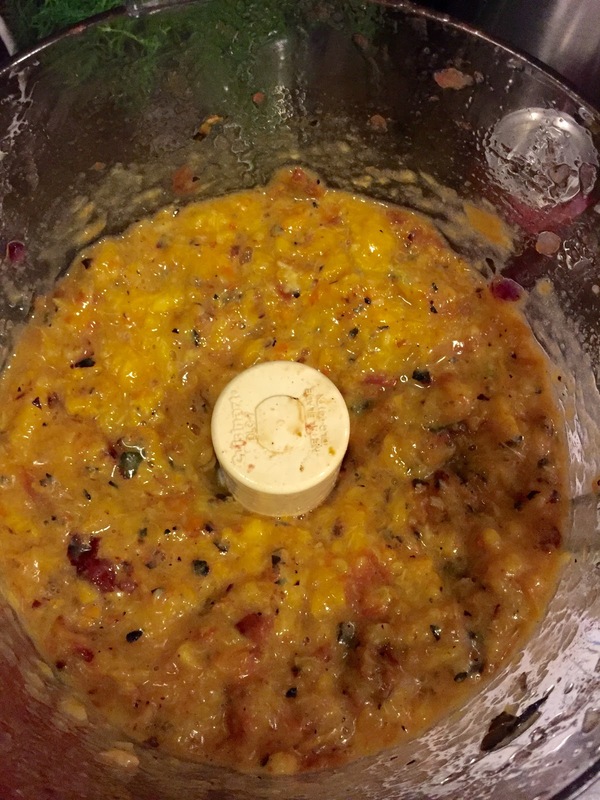 Puree all but a quarter of the salsa in a food processor or blender, until the mixture is thoroughly pureed but not perfectly smooth. Add back some of the reserved salsa to the puree and serve cold, immediately. The gazpacho will hold for up to 2 days. At the third day, it may start to ferment. If it tastes "off' or "fizzy" it's time to toss it.